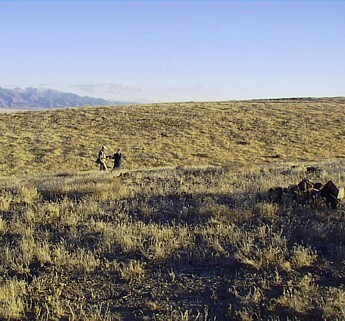 Northern Nevada is home to the state's best known placer field for nugget shooting with a metal detector, the Majuba or Rye Patch placer district. The area is located west of the Rye Patch Reservoir, about 45 miles north of Lovelock in Pershing County. The district can be reached by taking the Rye Patch exit off Interstate 80, then crossing over the Rye Patch Reservoir Dam, and turning north. In spite of intensive prospecting in this region beginning in the 1860's, this placer field was not discovered until 1938, by local Pershing County resident Charles E. Dice. Mr. Dice worked the area by drywashing for several years through the early 1940's, producing over six hundred ounces of placer gold. Sporadic prospecting work by others has continued ever since. The gold is found in irregular concentrations which spread out over an area of several square miles on a pediment spreading out from the east side of the Majuba Mountain range, located within T32N R32E, MDB&M. Within that township, placer gold has been found over a wide area, including sections 8, 17, 18, 19, 20, 30 and 31. Other discoveries have been made in the general area. The most outstanding feature of the Rye Patch deposit is it's shallow nature, with most of the gold being quite near the surface. This makes the area attractive for nugget shooting with a metal detector. Nearly all mining has been done at depths less than a few feet, and little gold has been mined below this layer. 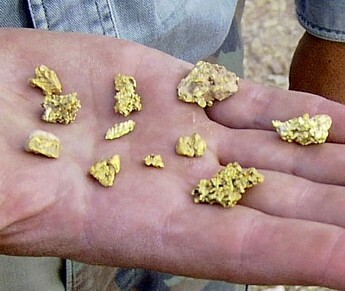 Most gold is found as nuggets, though a smaller amount is in the form of gold-quartz specimens (such as the example shown above right) and as nuggets of mostly quartz-free gold. Some fairly large nuggets have been found. Rye Patch, and to a lesser extent, the area around it is famous for crystalline "chevron" nuggets. While not every piece is of the chevron shape, some nice examples are found with metal detectors. 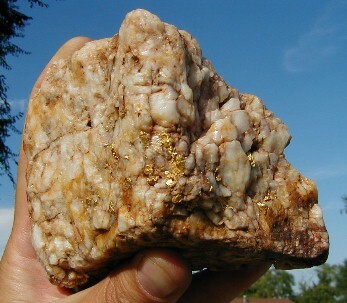 The larger gold-quartz specimen pictured at top is estimated to contain 10 ounces of gold. None of the gold from Rye Patch shows much indication of traveling far, and though no significant in-place gold-quartz veins have been found in the mountains above the deposit, the source is likely erosion from small, shallow epithermal veins in the placer area itself. Much of the gold tends to concentrate in distinct patches. 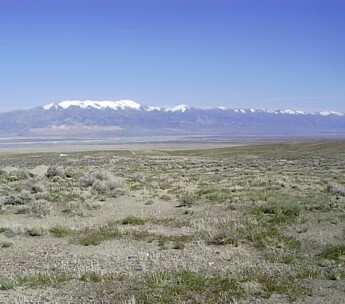 There are no trees in the area of the placer deposit, only sparse sage brush covers the surface. The terrain is comparatively flat, and easy to access. Before discovery of the placers, the Majuba Mountain area was known principally for its base metal deposits, including an unusual copper-tin deposit. Property ownership of the area is split between BLM land and private railroad land. The even numbered sections are BLM land and the odd numbered sections are private (originally Railroad Property), even though the surface rights on those odd numbered sections in this area belong to the BLM. There are a number of claims on the BLM property, so investigation into land status is necessary - be sure to check before prospecting and stay off private claims. Although the area has been detected extensively since the 1970's there is still gold to be found. As far as facilities, some people dry camp out at the placer site, but there is also an excellent campground with water at the Rye Patch Reservoir dam, only a few miles from the placer deposits. A convenience store and gas station is located at the intersection of I-80 and Rye Patch Road. Although the map shows that the best road might be the road from Polker Brown to the placers, it is not suitable even for most 4 wheel drives. It is best come over from the west off the road just west of Rye Patch Reservoir.